The following documents are for event coordinators, organizers, and instructors holding a PCTA saw training. You can find the PCTA saw program policy, instructor evaluation forms, Go or No Go Cards, the classroom presentation, and more. If you have questions about any of the documents, please contact Ian Nelson, PCTA’s Saw Program Coordinator, at [email protected]. PCTA Saw Program Policy Overview of the PCTA Saw Training and Certification Program. Updated November 2017. PCTA Saw Program Vision and Purpose Vision and purpose statements for PCTA Saw Program crafted by PCTA volunteers and staff. December 2018. PCTA Saw Program Approval Letter This letter recognizes the PCTA Saw Program as an approved cooperator saw program which meets the requirements of FSM 2358. Updated February 2018. Word | PDF US Forest Service Manual that establishes consistent National training, evaluation, and certification requirements for the use of chain saws and crosscut saws by employees, volunteers, training consultants, and cooperators on National Forest System lands. Updated July 2016. 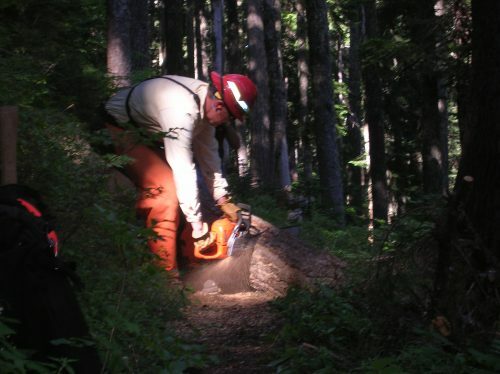 PDF US Forest Service guide (v. 1.3.2) that defines common terms and definitions and identifies implementation standards for chain saw and crosscut use by Forest Service employees, volunteers, training consultants and cooperators. Updated February 2017. VSI Teaching Tool Kit List of items required to facilitate a saw training course both in the classroom and field. Updated April 2016. “Saw Safety for Volunteers” Presentation PowerPoint presentation for the classroom portion of the saw training. Provides a program overview as well as initial saw safety, knowledge and skills. Updated April 2019. Saw Safety Presentation Portion of PowerPoint presentation (in PDF format) covering saw safety program, requirements, and situational awareness. Updated April 2019. Bind Analysis & Cut Sequence Portion of PowerPoint presentation (in PDF format) covering types of binds, types of cuts, general considerations, and hazard tree scenario. Updated April 2019. Chain Saw Specific Training Portion of PowerPoint presentation (in PDF format) covering chain saw components, maintenance, use, and safety. Updated April 2019. Crosscut Saw Specific Training Portion of PowerPoint presentation (in PDF format) covering crosscut saw tools, parts, maintenance, use, and safety. Updated April 2019. Word | PDF Saw operator field evaluation form for crosscut saw (bucking only). Updated January 2018. Word | PDF Saw operator field evaluation form for chain saw (bucking only). Updated January 2018. PDF A certification card is valid only when signed and distributed by designated PCTA staff. Certification cards will be distributed to saw training attendees once they have submitted current First Aid and CPR certification and successfully completed an official PCTA saw training under an approved instructor. Updated April 2018. Go or No Go Handout Corresponding handout to go with the Go or No Go cards. Updated February 2014. Go or No Go Cards Go or No Go cards to be distributed to saw attendees. Updated February 2014. Chain Saw Initial Certification Quiz Saw training attendees seeking their initial chain saw certification are required to fill out the quiz prior to the training and and bring it with them. Updated February 2012. Chain Saw Tools Checklist Tools and items needed for chain saw training and testing. Updated December 2018. Crosscut Saw Initial Certification Quiz Saw training attendees seeking their initial crosscut saw certification are required to fill out the quiz prior to the training and and bring it with them. Updated February 2012. Crosscut Tools Checklist Tools and items needed for crosscut saw training and testing. Updated December 2018. Saw Training Course Application The application template for the PCTA saw training. Applications will typically be offered through an online form located on the PCTA website. Updated February 2012. Class Sign-in Sheet Sign-in sheet for students and instructors. Record travel and prep time. Indicate if instructors are volunteers, agency partners, or nonprofit staff. Updated 2014.